If you love stingy brim hats, and like them with style, you're in luck because Steven Land has just released their all new collection of mens dress hats. Steven Land is no stranger to style and fashion and their collection of great looking stingy brim hats reflect this. 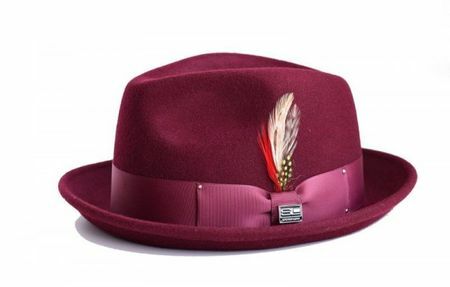 This burgundy stingy brim hat is made of luxurious feeling Australian wool felt that feels like Cashmere in it's buttery soft touch with a satin lining of course for the quality that you expect from a fine Stingy brim hat.